WATCH | 50 to 100 truckloads of trash a day to be removed from Manila Bay. rehabilitation is ordered by President Rodrigo Duterte. 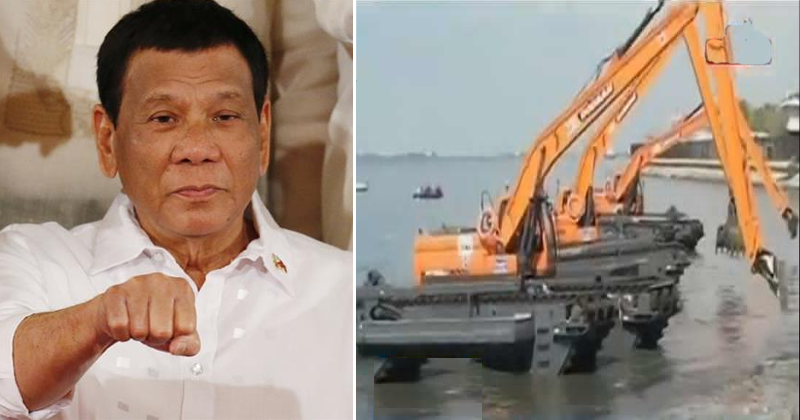 The Department of Public Works and Highways (DPWH) started dredging operations in Manila Bay on Tuesday and is expecting to collect 50 to 100 truckloads of trash each day, according to a report by Maki Pulido on Balitanghali. DPWH deployed 28 equipment for the dredging operation, including amphibious excavator, dumping scow, debris segregator, dump truck, and street sweeper. Every day, the operation targets to remove 225,000 metric tons of trash and mire from the Manila Bay, which is under rehabilitation as ordered by President Rodrigo Duterte. The dredging operation will start off with 50 meters from the shore of the Manila Bay and will continue in sections until it finishes 1.5 kilometer of the Manila Bay shoreline, from US Embassy to Manila Yacht Club. Fifty personnel from the DPWH are tasked to the operation. With the P1-billion fund, the DPWH is planning to buy new equipment for the dredging of Manila Bay. The cleanup drive started in January producing breathtaking results and drawing tourists and guests to the bay. Talks, however, surfaced that the rehabilitation was in preparation for the reclamation projects in the area. Meanwhile, Department of Environment and Natural Resources (DENR) secretary Roy Cimatu said if he cannot stop the reclamation projects, he will ask the Department of Science and Technology (DOST) to conduct a study for a ‘science-based reclamation’ to serve as guidelines.